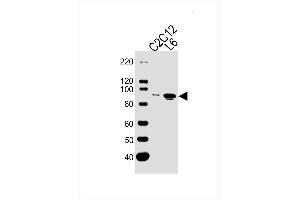 Lane 1: Mouse C2C12 Cell Lysates, Lane 2: Rat L6 Cell Lysates, probed with Musk (1429CT456.173.44) Monoclonal Antibody, unconjugated (bsm-51427M) at 1:1000 overnight at 4°C followed by a conjugated secondary antibody for 60 minutes at 37°C. 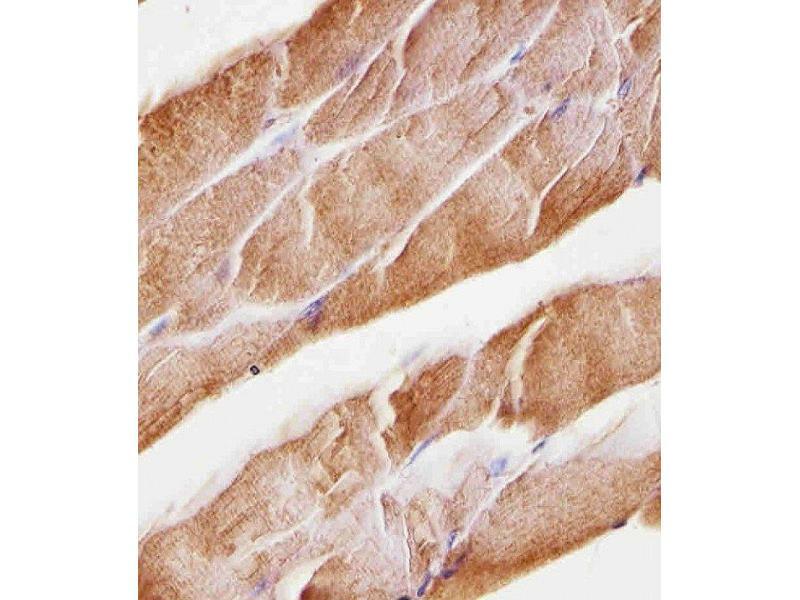 Paraformaldehyde-fixed, paraffin embedded mouse skeletal muscle tissue, Antigen retrieval by boiling in sodium citrate buffer (pH6.0) for 15min, Block endogenous peroxidase by 3% hydrogen peroxide for 15 minutes, Blocking buffer (3% BSA) at room temperature for 30min, Antibody incubation with Musk (1429CT456.173.44) Monoclonal Antibody (bsm-51427M) at 1:25 for 1 hour at 37°C, followed by a conjugated secondary antibody for 20 minutes and DAB staining. 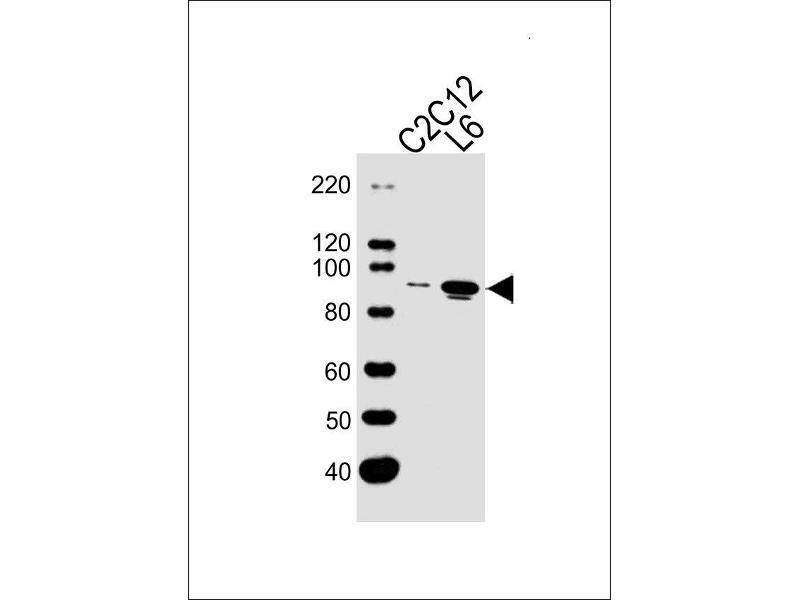 Immunogen This mouse Musk antibody is generated from a mouse immunized with recombinant protein from mouse Musk. Receptor tyrosine kinase which plays a central role in the formation and the maintenance of the neuromuscular junction (NMJ), the synapse between the motor neuron and the skeletal muscle. Recruitment of AGRIN by LRP4 to the MUSK signaling complex induces phosphorylation and activation of MUSK, the kinase of the complex. The activation of MUSK in myotubes regulates the formation of NMJs through the regulation of different processes including the specific expression of genes in subsynaptic nuclei, the reorganization of the actin cytoskeleton and the clustering of the acetylcholine receptors (AChR) in the postsynaptic membrane. May regulate AChR phosphorylation and clustering through activation of ABL1 and Src family kinases which in turn regulate MUSK. DVL1 and PAK1 that form a ternary complex with MUSK are also important for MUSK-dependent regulation of AChR clustering. May positively regulate Rho family GTPases through FNTA. Mediates the phosphorylation of FNTA which promotes prenylation, recruitment to membranes and activation of RAC1 a regulator of the actin cytoskeleton and of gene expression. 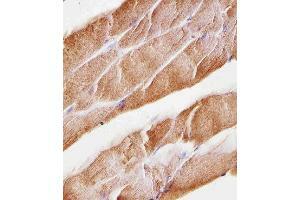 Other effectors of the MUSK signaling include DNAJA3 which functions downstream of MUSK. May also play a role within the central nervous system by mediating cholinergic responses, synaptic plasticity and memory formation. Storage Comment Store at 4°C for up to 2 weeks. For long term storage, store at -20°C in small aliquots to prevent freeze-thaw cycles.